I've been crazy-productive today and am so proud of it. The craft room even got picked up. I just couldn't take it anymore. There's still a few spots that need some attention, but I can actually walk through the room right now. I told you. . .CRAZY! 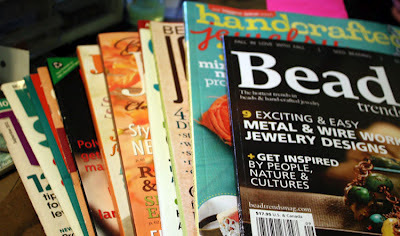 I sorted and stacked my jewelry magazines, pulling out my most recent copies (see above). From there, I proceeded to gather, record, and file information on submitting to each of them. I guess after jumping yesterday's hurdle, I'm ready for more. What happened yesterday you ask. Well. . . yesterday I sent in two pairs of earrings and two bracelets for consideration in one of those magazines. I'm totally not expecting to get in my first try, but wouldn't that be awesome?! After marking my calendar of other magazine deadlines, I started on a custom order for a friend. She asked for green. . .and green is what she's getting! 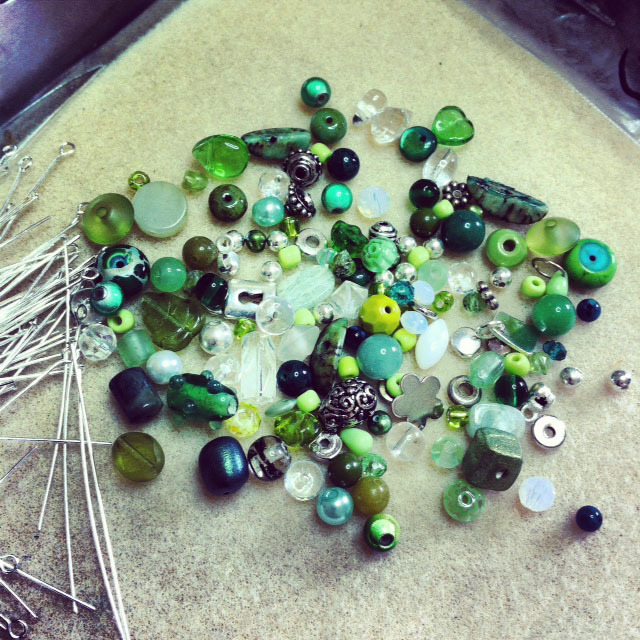 What's been on your craft desk today? 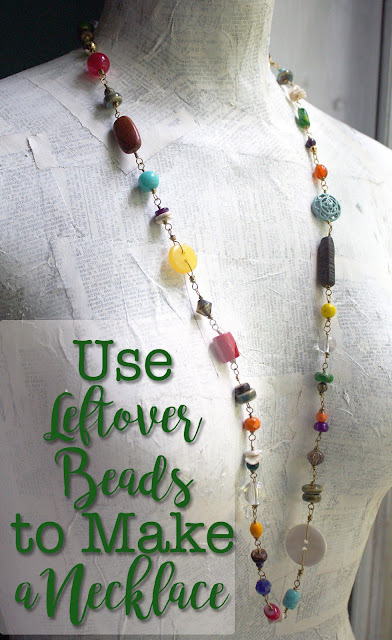 Share it in the Bead Table Wednesday Flickr Group. 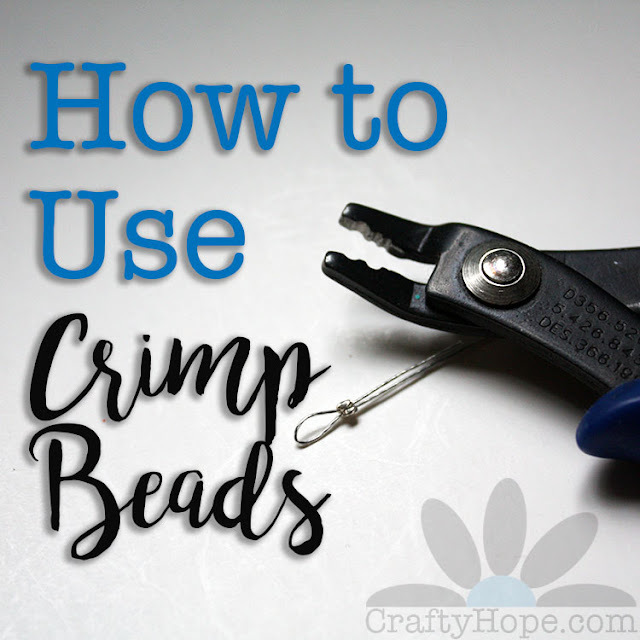 I also took the time this morning to list these earrings. And now I've gotten a blog post written. BAM! It's just mind-boggling how much I can get done in a day when I really try. Wait until tomorrow, I'll probably be singing a different song then. That's always the way isn't it? Yeah for being productive. Good luck with the submissions! Good for you for taking the leap into magazine submissions -- can't wait to see your work on the magazine racks! Good for you on being productive today. Mine started out badly with me staying in my PJ's until around 10:00 am. But after lunch I got a lot of stuff done. Those owl earrings are adorable!!! Congratulations on all that you accomplished today! Those are the cutest little owl earrings. You are supercharged! i think we are all eagerly awaiting word about the submissions! (did that sound as bad to you as it did to me?!) i needed to clean and de-clutter my brand new workspace that i swore i would keep organized...all i managed to do was empty the trash. and all the trash was was cut up thread from my botched attempts at weaving new jewelry. Heather- Thank you so much! I do appreciate it. Cynthia- Ha! Yeah, we'll see how today goes. I'm heading out to visit my grandmother in a bit so very little will get done around the house. I hope you're knocking it out though!! 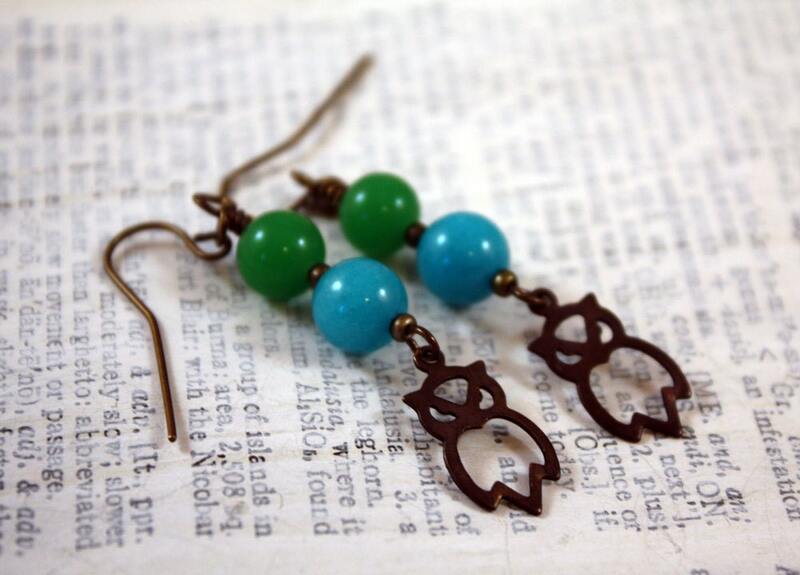 Love the little owl earrings, they are just too adorable! I hope your entries get accepted - that's always so cool when that happens!! Fun BTW :) Good luck with submissions. Hope you're published!